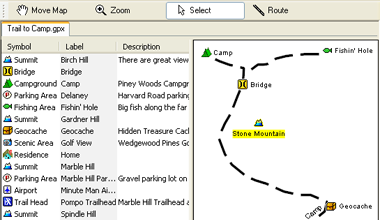 Download free GPS software for your Garmin Oregon 450t GPS! in a list, with a plot of your Garmin Oregon 450t GPS data on the right side of the screen. 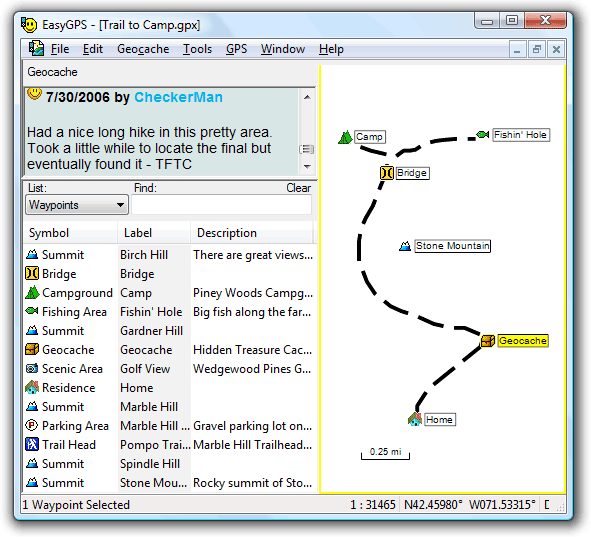 EasyGPS is the free, easy way to upload and download waypoints, routes, and tracks between your Garmin Oregon 450t GPS and your Windows computer or laptop. Backup your favorite Garmin POIs, create and send new waypoints and geocaches to your GPS, or print a map of your GPS tracklog. 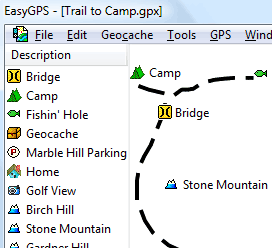 To get started, download your free copy of EasyGPS. If you're a geocacher, EasyGPS lets you download geocaching GPX and LOC files directly to your Garmin Oregon 450t. Backup your Garmin Oregon 450t GPS waypoints, routes, and tracks after each outing, so your GPS data is always safe on your computer. Many EasyGPS users clear the memory in their Garmin each time after backing up in EasyGPS. This gives them the maximum data storage for recording waypoints and tracklogs on their next adventure. 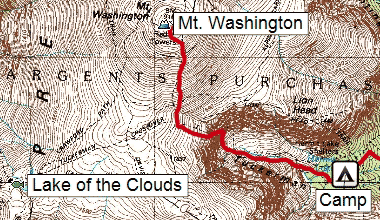 ExpertGPS also lets you view your GPS data over topo maps, aerial photos, and your own scanned trail maps. If you're serious about getting the most out of your GPS, check out the free trial of ExpertGPS, the ultimate mapping software download for your Garmin Oregon 450t GPS.